ALEBTONG – The government will construct more than 70,000 small scale irrigation schemes countrywide to improve agricultural production and productivity, an official has said. Eng John Twinomujuni, the assistant commissioner in charge water for production in the Ministry of Water and Environment, said the irrigation schemes will be constructed in each parish in Uganda. The project will benefit organised farmer groups comprising the youth, men, women and the elderly. Progressive and commercial farmers will also be supported under the project to be implemented in the next 21 years. “Government directed that the ministry should try to implement at least one in each parish in Uganda. I think we now have over 70,000 parishes in Uganda and we are trying to ensure that we have at least a scheme in each parish,” Eng Twinomujuni said in Aloi Sub-county in Alebtong District on Friday. The assistant commissioner was in the area to commission Owameri small scale irrigation scheme. This particular scheme is currently benefiting 400 farmers in Aloi Sub-county. Eng Twinomujuni said although the programme is still new, 40 irrigation schemes have so far been completed countrywide. “We have around 120 schemes which are at various stages of design and construction and government is putting in more resources within the coming financial year such that we can construct as many as possible. So we think it’s the way to go to empower our people and to fight poverty,” he said. 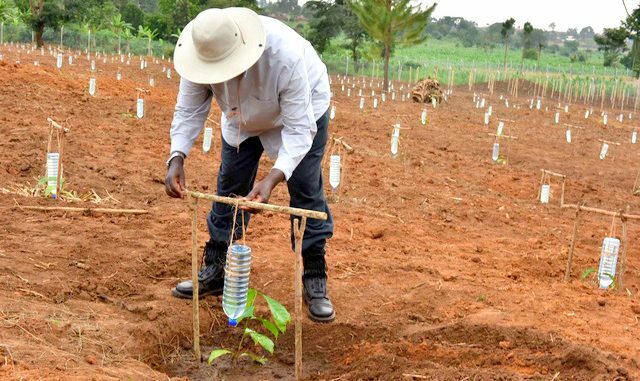 The beauty about this small scale irrigation scheme is that farmers in drought-stricken areas will be able to plant crops when others, who mainly rely on rain-fed agriculture, are not able to plant. The chairperson of Owameri farmers’ association, Ms. Mercy Gwom, said the Owameri small scale irrigation scheme is faced with stressing challenges. The challenges include lack of safe drinking water, fire extinguisher and lack of vehicle to transport produce to markets. “We request government to open up a police post at the scheme to provide security to the facilities otherwise thieves may come and steal our crops at night since there are no security lights,” Ms. Gwom said. Ms Costa Okello, the chairperson of Can-opwonya farmers group, said they were adequately trained to handle commercial agriculture. “We planted cabbages and we were expecting to raise some good money for paying our children’s school fees, but the major challenge we had was drought which affected the quality, so we resorted to growing watermelon, which is doing very well,” she said. There are 21 groups at Owameri scheme that has 21 acres of farmland. Mr. Isaac Okeng of Alpha farmers group said they chose to grow tomatoes because of its available market. “We realised that during the dry season there is scarcity of tomatoes yet the demand is very high, so we started growing tomatoes and we are selling each box of about 100 pieces of tomatoes at Shs30,000,” Mr. Okeng said. Alebtong District agricultural officer, Ms. Jenifer Oyuru, said the project came at the right time when the area is badly hit by drought. “So it will improve on the nutrition security of the community and improve their livelihood,” she said in a separate interview. Government adopted an irrigation policy last year. The policy was launched the same year. One of the strategies of implementation of this irrigation policy is the construction of small scale irrigation scheme. Uganda has got around three million hectares of irrigation potential. “Government has a strategy that by 2040, we should have irrigated around 50 percent of that. And we think we are on course if we continue at this pace, we should be there by 2040,” said Eng John Twinomujuni, the assistant commissioner in charge water for production.